If you're looking for an affordable good old boat that needs major fixing up, you've come to the right place. We're looking for abandoned, deteriorated sailboats in need of a new dreamer to turn them into a dream boat once more. So if you know of one, get in touch! And if you're interested in one of those listed here, follow your heart and follow up. Call the number listed. Have something to add? Contact us. There's no charge to list a fixer-upper. But you must be selling it for $5,000 or less. We will list your boat for six months and will notify you at that time to see if you wish to renew the listing. If it goes to a new home within six months, please let us know and we'll remove the listing. There's no fee for the buyer either. We just want to help you find the boat of your dreams. Dream of sailing the world’s waterways on a boat you can handle solo, but large enough to accommodate family and friends for the weekend or longer? Want a well-designed sailboat you can race or cruise at leisure, and easily trailer to your next destination? Want to save money and have fun by restoring a project boat? If you do – then consider this 25-foot trailerable racer-cruiser designed by E. G. Van de Stat and built by Dehler Yachts in 1986. I bought the boat from the original owner and stripped the interior and fittings, planning to restore the hull to perfect condition inside and out. Because I will soon be attending graduate school, I will not have enough time to complete the project and decided to pass it along to an interested person who can. The experience of working on a boat will provide a great deal of enjoyment, learning, and make you a better sailor. The book From a Bare Hull by Ferenc Mate (included) provides all the information an interested person needs to return this boat to sailing condition. Comes with West System fiberglass materials and instructional DVDs. Complete rehab needed but worth saving if you’re willing to put the sweat equity and some money into it. Life changes and advancing age preclude me from ever getting it done. This is the boat that was subsequently reworked into the better-known Islander Freeport 41. The Good: A solid hull, classic ‘clipper’ lines, very roomy interior with separate aft cabin for longer cruises or liveaboard, all the parts are there: Standing rigging complete and serviceable; Yacht Specialties pedestal steering with 28” destroyer wheel; Danforth Constellation compass; two massive anchors; electric windlass (needs repair); Some extra parts and odds & ends I accumulated for the project. The Not-So-Good: (1) Engine is a Chrysler Nissan [65 HP] diesel which should probably be replaced or at least rebuilt. It ran fine when I bought the boat eight years ago but hasn’t been run since and has some surface corrosion; (2) Will need new fuel tanks – original steel tank very rusted; (3) Sails are probably useable but not great; (4) Boat should be re-wired to current ABYS standards – it was pretty hodge-podge by the time I bought it; (5) Bottom paint needs to be stripped; (6) Some interior re-building work and general interior/exterior refurbishment needed. Boat is currently on the hard in East Falmouth MA in a private yard and will need to be moved from its current location by the buyer. Asking $5,000 but will listen to reasonable offers. We previously listed this boat in the GOB classifieds for $7,500, but we're forced to drop the price for a quick sale as our marina is for sale and we have to get out! Titania needs a new home ASAP-can you give her a good one? We are now asking $4,950 for her. Titania is a 32-foot Cherokee, appearing in a Good Old Boat magazine article back in the May/June 1999 issue. She worked her magic on two friends who bought her in a three-way partnership 21 years ago. The marriage of the two friends is still going strong but we aren't as young and fit as we were back in 1996 and now we need a smaller simpler boat that doesn't draw five feet . 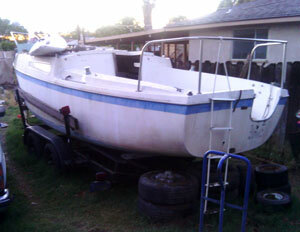 An easy-to-manage trailer sailor that can be dry sailed and stored in our yard is in order now. Titania boasts a 9-foot beam, approx 9000 pounds displacement, a 5-foot draft, iron ballast, and 435 sq ft of sail area. She is a classic S&S design, with a fin keel and beautiful lines, mannerly well balanced, and responsive under sail. I have single-handed her for many years on day sails and charters, and she is an ideal boat for a couple to cruise. She is fully functional (though just hauled out for the winter) and has two deep-cycle batteries (2016), a new depth sounder (2017), two new compasses (2016), and an assortment of other not-new gear and sails including inverter, high-output alternator, tiller pilot, dodger, low hours on rebuilt Atomic Four, three jibs, drifter and main, tiller steering, VHF, two electric plus hand bilge pumps, six new keel bolts, plow and Bruce anchors, rodes and chain, docklines and fenders, spare parts, phone charger, stereo, and other gear. She has always sailed on fresh water except for one short trip south back in 1999 and is now on Lake Ontario. 1970 Classic. Solid full keel sloop. Sad owner reluctantly retiring from sailing. However, Picnic is ready for new adventures with a younger crew. Good canvas, RF jib, all lines led to cockpit and easily single-handed. 9.9hp electric tilt OB new '11. 4 berths, radio, Porta Potti, stove, boat cradle. Long term resident of Madeline Island Marina, Lake Superior..
1971 Cape Dory Typhoon Weekender, Hull #161. Nearly new main with one reef. Newer Mack 150 Genoa and brand new 110 working jib. Full complement of cushions, interior teak excellent, exterior teak serviceable. Spars and rigging are ready to go. Porcelain head, no tank. This boat is in sailing condition but needs TLC. Comes with a 3.5 hp Nissian long shaft kicker. Excellent wide stance, custom galvanized float off trailer included. Project boat: complete except for engine. Requires extensive restoration. Hull and most interior woodwork and appointments in good condition. No blisters. No cushions. Includes sails, AC, heater, winches, anchors, other extras. As is, where is. 24' Gaff Rigged Atlantic City Cat Boat. LOA: 24'; BEAM 11'; DRAFT: 2'/5' approx. with board down; DISP: 8000 LBS. SAIL AREA: 452 sq. ft.; HEADROOM: 6'2"; BERTHS: 6; 12 HP BMW inboard diesel Very roomy catboat with large cockpit and cabin with 6 berths. Stand up head with shower grate. The trailer was new when boat was placed on it in 2014). Shed is free. Buyer must disassemble shed. CONDITION: Hull is in overall good condition. One spot on transom around thru-hull that appears to be gel coat not adhering to fiberglass. Centerboard trunk and equipment appear in good condition. DECK: Foredeck (approx. 3' x 4') needs to be re-cored in forepeak around mast hole and hatch. There is a spot on side deck about 8" x 24". This could go to the bow. I do not know for sure. CABIN TOP: Good condition as far as I can tell. COCKPIT SEATS: Need coring where the steering gear comes through, about 3' wide 18" each side. CENTERBOARD: I have not dropped it down but I know the original owner had it powder coated at some point in time. RIGGING: Mast boom gaff, good condition. Needs mast hoops and running rigging. The rest of the interior is in serviceable condition but needs spruced up. Boat is on a steel cradle – 20', 14,000 lb. tandem axle equipment trailer and is under a bow roof shed that is shrink wrapped and has a wood floor. 1978 Pearson 26, OD, with 10 hp 4 cycle high thrust outboard. Roller furling headsail, main, knot, depth, compass. Cradle. In very good condition. I have an old 14' Starfish that I would love to give to someone who can continue to love it. It comes with all its parts - sail, mast, booms, centerboard, tiller. It will need a lot of fiberglass work, I imagine, just from neglect. And a new sail. It was a huge part of my life for many years, but now sits covered in the yard and needs a new home. Two sets of sails, mast, boom and rigging in good condition. Trailer. Location: Long Beach Island, NJ. Port side damaged during storm. Bulkhead intact below water line. If you're good with fiberglass repairs here is a great project. Boat is intact, all rigging, blocks, mast boom, gaff, new rudder, tiller, cushions for cabin and cockpit, halyards, 2 sets of sails and double axle trailer (not pictured). Parts alone are worth the asking price. Sea Wench is on the upper Chesapeake bay. I hate to see her go to ruin, but I'm incapable of doing what needs to be done. Preserving a Lapworth designed Cal 28 on the Chesapeake, where almost no others sail, is a good goal. The Cal 25 fleet is still active and the Cal 40 still preserves a lofty status - both Lapworth designs. Here's a PDF file with photos and more information about Sea Wench. 1976 Fiberglass trailable. Sleeps 3 (5 if couple w/3 kids). Galley w/sink and ice box. Package includes sails, ropes, and many other items. Strong 4-wheel trailer. 12 volt winch allows 1 person to put up and position the mast and mainsail. Evinrude "Sport Twin" 10HP OB. 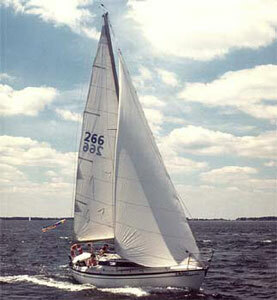 My GOB is a 1973 27' Dufour "Dinette" sloop; I am the second and sole owner since 1979. Except for actually hauling the boat out of the water, I've generally maintained her myself. I rebuilt the Volvo diesel engine and made numerous upgrades and innovations over the past 35 years of sailing her on the Chesapeake Bay and around the Eastern Shore. But age takes its toll on humans as well as boats, and she is in need of foredeck lamination repairs and work on the auxiliary (possibly repowering) as well as cosmetic attention. She comes well equipped (gear has age but is still serviceable) and ready to sail away after the aforementioned repairs. Except for my wife of 31 years she has been the love of my life and I hate to part ways, but it's time for a new owner to take her on and restore her to her glory. She's a stable boat (rigged for single handing), points well, has sailed through numerous squalls. I'd be glad to introduce you and let you see for yourself what a great boat she is and can become again. Slip lease is up for renewal, so I'd like to sell her soon. I feel $4,000 is a very fair price for this French lady. Ahoy, I am saddened to admit my GOB has slipped (pardon the pun) my attention over the past few years and become somewhat of a fix-it-upper in need of maintenance that is stretching my physical resources. Priorities have shifted and at 73 I'm not as nimble as I once was in being able to cram myself into the cockpit locker, lazarette or engine compartment. With sciatica and two torn rotator cuffs, hauling on halyards, sheets, and anchor rodes, not to say lifting cast iron engines, transmissions and other heavy equipment or hauling myself aloft, sailing and maintaining my GOB has become more of a chore and less of a joy. 1974 Clipper sail boat and a 1973 AM (trailer which has permanent tags on it). Have both titles. Willing to let them go at a very reasonable price. The rigging is all there but no sail. No leaks anywhere but inside will need refinishing. It wasn't covered over this last winter. Need to move it right away. It was to be a project for my husband but his health will not permit it now.